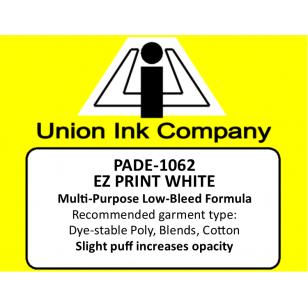 PADE-1062 is the low-bleed white in the famous Maxopake series, formulated for direct printing on cotton and polyester garments. It is especially good in manual print applications and has a small amount of puff to aid in opacity. 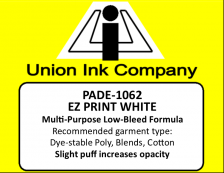 Low-Bleed EZ Print White 5.0 My favorite new white 02/21/2015 By Jeremiah Very easy printing, don't even need to stir. Had to flash when printing on black but on royal just did a second hit wet. Will get a gallon next time.